During Slovak Cuisine Week we will present the presidency menu, with traditional Slovak ingredients, which will be served in the European Commission canteens in Brussels. 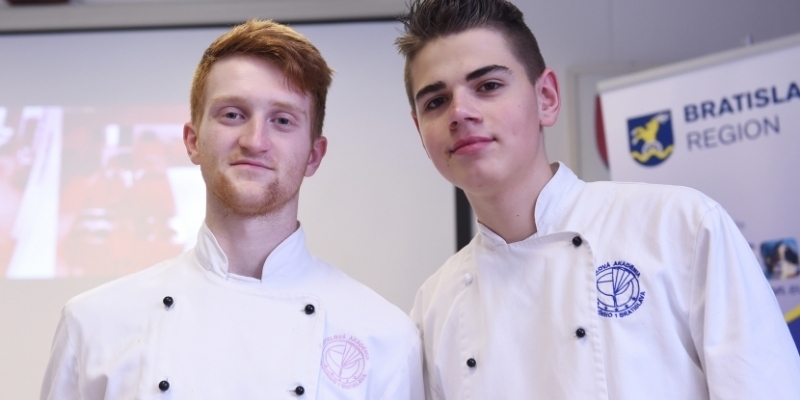 The menu has been created by two students of the Bratislava Hotel Academy, Filip Hýl and Samuel Veselský, with their teacher Kamil Foltýn who won the hotel schools competition. In September 2016, they will hold an initial training session for the European Commission's in-house chefs and will draw up an information sheet containing calories and allergens. In November, the presidency menu will be presented in turn in the individual canteens of the European Commission. dessert: cottage-cheese cake with peaches, strawberries and whipped cream. The event will be officially opened in the Berlaymont building by the Vice-President of the European Commission Maroš Šefčovič, who has assumed patronage of the event, the Permanent Representative Peter Javorčík and the head of the Bratislava administrative region Pavol Frešo.